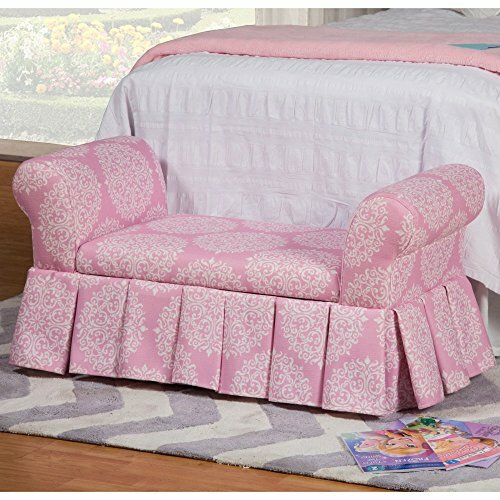 Help your child keep his or her room clean with the Kinfine Pink Kids Storage Bench. A toy box and functional piece of furniture in one, this beautiful storage bench looks at home beneath a window or at the foot of the bed. The design incorporates rolled armrests and a pleated apron skirt. Durable wood solids form the frame, overlaid with a thick layer of dense foam. Plush polyfiber fabric upholsters the piece, rosy pink in color and patterned with a white medallion floral pattern. Beneath the seat cushion is a roomy storage area that helps keep the floor clutter-free. Kinfine is based in Chino, California and got its start in 1993. This privately held company provides classical and on-trend occasional furniture, ottomans, benches, fabric headboards, dining chairs, barstools, accent chairs, accent tables, and juvenile furniture. Kinfine is known for providing quality home furnishings at a reasonable price point. Dimensions: 37W x 16.5D x 17.5H in.. Recommended for ages 2-12. Upholstered with a poly-fiber blend fabric. Light pink color with white medallion print. Sturdy wood solid frame. Hidden storage area beneath cushion. Dimensions: 37W x 16.5D x 17.5H in. If you have any questions about this product by Kinfine, contact us by completing and submitting the form below. If you are looking for a specif part number, please include it with your message.